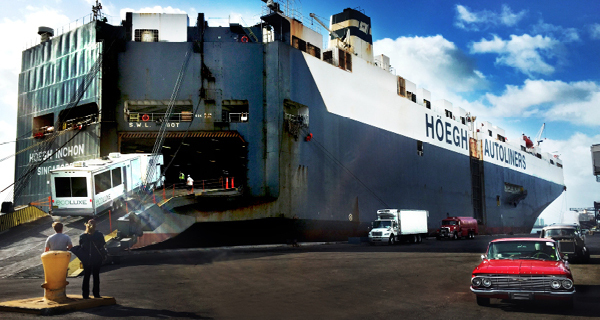 Double Ace Cargo handled all the logistics for the shooting of The Fate of the Furious in Cuba, including chartering the Höegh Inchon, an exclusive RoRo ship, to move all the cars, trailers, and special effects equipment. Logistics companies handling special projects need persistence and ingenuity—and have to expect the unexpected. Whether they are supporting ventures in embargoed countries or first-ever projects in remote locations, logistics providers must be prepared to think quickly and clearly when unanticipated challenges arise. Here are several examples of special project teams in action. Of the 136 vroom-vroom minutes that make up The Fate of the Furious, only about 15 take place in Havana, Cuba. Jam packed with rubber-meets-the-road scenes for actor Vin Diesel, those fleeting 15 minutes took roughly three weeks of long days to film—and months of around-the-clock logistics planning. And, like so many special logistics projects, the planning and execution were not for the faint of heart. Some logistics jobs come with a soundtrack. For the team charged with moving the 500-plus items featured in Exhibitionism—a four-year, 12-city touring show that covers the lifespan, to date, of the Rolling Stones—that soundtrack might well feature a continuous loop of 19th Nervous Breakdown. After all, the loot on display includes an array of priceless items, everything from onstage and offstage garments to handwritten lyric books and personal diaries, as well as some of the band's most treasured instruments. The nail-biting job of moving these artifacts between locations belongs to DHL, a global brand known for, among other things, its logistics work with the entertainment industry. In an interview by email, Christine Nashick, chief marketing officer of DHL Express Americas, recalls the complex operations behind the first stagings of Exhibitionism in London, New York, and Chicago. For the show's global launch in London, one of DHL's most important tasks was delivering the Marquee Club doors to the site. These adorned the venue that hosted the first-ever live performance by the Stones, making them sacred to die-hard fans. After the show left London, Nashick says, DHL assumed responsibility for delivering event infrastructure, most of the artifacts, and even the merchandise for the exhibit's retail efforts. Each time the exhibit moves, the logistics team must be summoned into action. "Overall, the size of the team and time committed has varied depending on the level of activity taking place," Nashick says. Clearing customs for a show like this can be challenging, but for the U.S. leg of the tour, that proved relatively easy, Nashick says. The bigger headaches centered around transportation. "One of the biggest challenges when touring a show like this can be logistics," Nashick explains. "We knew we had to pay special attention and due care to the fragile artifacts being transported. "The exhibition was moved by a combination of air, sea, and road," she adds. "The packing of the show pieces was undertaken in part by DHL and an art handler who specializes in moving fragile items. Fifteen shipping containers of freight were required to transport this iconic body of work." Wheeling Stones memorabilia on traffic-clogged highways or flying it through even the friendliest skies is fraught with "what ifs." Road closures, flight delays, turbulent weather—all had the potential to stall progress and inflate costs. "We did have contingency plans in place; for example, the operations team had alternative routing that could be deployed and additional resources that could be called upon," Nashick says. Fortunately for the team's sanity, Plans B, C and so on were unnecessary. No one needed Mick, Keith, and the gang to come to their emotional rescue.